Full Price: $ 160.00 6% off! 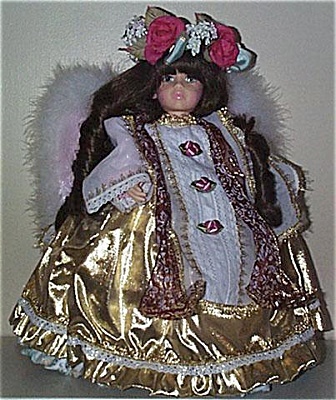 Saranade is a 14 inch vinyl Christmas Angel doll that Chris Miller designed for Pittsburgh Originals in 1995. This stunningly beautiful doll has a sweet serious-face, a wig of long brown ringlets, and painted green eyes. She is wearing a colorful gold and rose floral head wreath, a gold over pink gown decorated with rosebuds, and pink and white fur wings. Limited edition of 1,000. Doll is new and mint-in-the-box old stock with an adjustable metal stand and all paperwork.